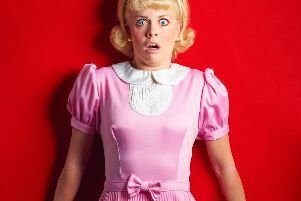 HARROGATE THEATRE COLUMN: Katy loves a panto - oh yes she does! Katy Dean is a familiar face when it comes to Harrogate Theatre’s much-loved pantomime. She tells us more about her favourite bits, and reveals what it is about Harrogate that keeps her coming back. What was your favourite panto and why? Tough one, as they all hold different memories for me. Probably Jack and the Beanstalk. I had great songs, a huge fight scene and a ridiculously big beanstalk that had a mind of its own. I remember laughing a lot that year. Do you prefer playing a good guy or a bad guy and why? Both have plus points but I would say a goody just about wins. When you’re a baddy you’re always on stage left on your own and don’t get to mix too much with the rest of the company. Although it’s very fun being bad and hearing the audience scream and boo you. What are the highs and lows of a 70-show run like panto? Highs - going onstage each day and playing. It’s such a good job. Seeing the look on the children’s faces when they are watching panto is very fulfilling. Lows - Most definitely the run up to Christmas, we usually do a two week stint with two shows a day and no days off. By the time Christmas Day comes you’re exhausted. I once fell asleep at the dinner table at my brother’s on Christmas Day. A singer. My mum knew I was going to be an entertainer when she spotted me swinging a walking stick around like Charlie Chaplin whilst singing “you give me the old soft shoe” I was about five. You’ve been back to Harrogate seven years in row this time, what do you like about Harrogate? Harrogate is a very special place for me. Phil Lowe took me under his wing all those years ago and keeps asking me to return. I’m incredibly grateful. The whole team are like family now. Having worked in many theatres including the West End I can honestly say Harrogate Theatre treats you the best. We are so looked after here. It’s also where I fell in love with my partner Phil Stewart who returns with me this year and will be playing the Dame. We got engaged in Harrogate last year – he surprised me in between shows and I then had to go on stage and play a baddy when all I wanted to do was smile from ear to ear. Katy returns to Harrogate Theatre this year for Beauty and the Beast. It runs from December 6 to January 21. Tickets are on sale now and available from 01423 502 116.